After years of searching - and then a several very intense months of coveting - I have finally acquired a Bog Oak spindle - and a very finely made one, too. Well ok, only the very top bit of the whorl - the dark bit - is the Bog Oak, but that is enough for me. To think that this specimen has been carbon dated to 3300 BC - and is therefore over 5000 years old - is simply amazing. Prior to this acquisition I had only had the briefest encounters with bogs and the things that have ended up in them. Years ago, when I lived in London, ON the Byron Bog was a favourite destination to...attempt on the weekend. I say "attempt," since it was often so water-logged that merely entering was impossible, unless one was keen on getting seriously bogged (ha) down in the muck. I always wanted to go deeper in, hunting for rare orchids and carnivorous plants - I think I may finally attempt this next Spring/Summer. I can't help but wonder what has sunken into that particular bog, and I'm sure that something has, sooner or later. Perhaps some lovely wooden bits such as my piece of Bog Oak lie in its depths? Or maybe something - or someone - else lurks within? I had the chance to meet Lindow Man this past March which was quite a thrill, to say the least. I am pleased to report that we have another date scheduled for the end of the month. And of course one should not forget the objects dropped into bogs (either accidentally or on purpose) that have made their way down the ages to us. Though it was a decade ago, I recall standing in front of a couple of fine bronze Scythian cauldrons - a rare opportunity that would never had happened had they not made their way into the belly of a bog all those centuries ago. They were handsome pieces - very sturdy and fine in their simple lines - and bore a patina that was quite unusual for bronze. My two companions wondered out-loud (and loudly) as to what could have caused this - but turned a deaf ear when I suggested that perhaps it was a by-product of dwelling at the bottom of a very acidic bog for centuries. To this day I can't help believe that I was on to something there. I myself am not entirely familiar with the finer points of the chemistry of peat bogs but it seems to me that nothing short of a kind of magic occurs within their depths. Pots, plants and people go in - and then come out in the far-flung future. They are all the truest of time-travellers and we are fortunate to be able to make their acquaintance. And while I'm on the topic of Scythians, here is Andrew Bird's song about them. I can't help but wonder if he saw the same travelling exhibit that I had back way in 2001. I will even forgive his mispronounciation of their name, but only because he is so cute. Lovely spindle! Where did you find? Does it spin nice? December 1, 2011 at 9:39 p.m. 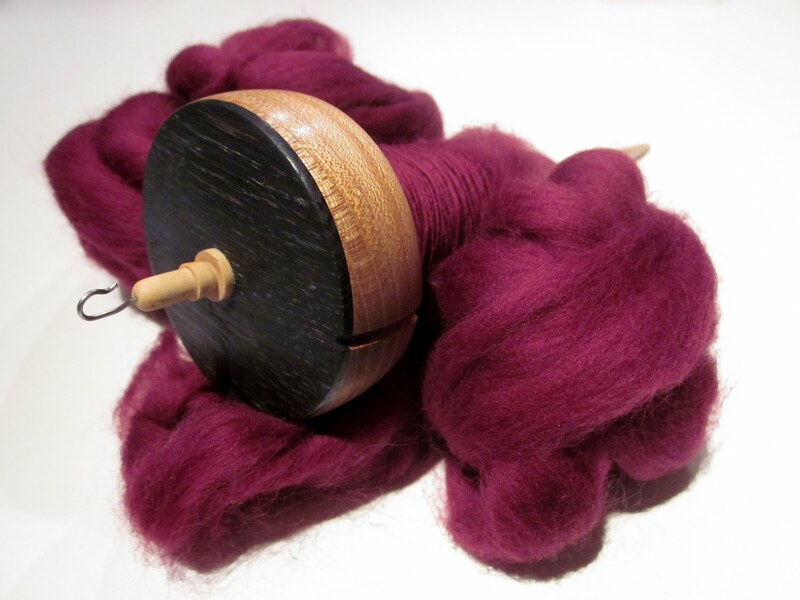 I need need need a spindle. No idea how to spin, but oh how I need one. SO lovely. December 2, 2011 at 4:44 a.m.
That was a fascinating blog post! Bogs surely could make one's imagination go wild! The spindle is really lovely. I hope it brings you much pleasure! December 2, 2011 at 8:09 p.m.
January 4, 2012 at 3:05 p.m.